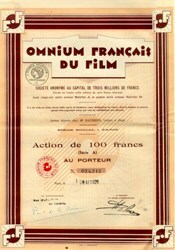 Beautifully engraved Certificate from the famous Omnium Francais Du Film issued in 1928. This historic document has an ornate border around it with an art deco flare to its design and back print. This item is hand signed and is over 72 years old.